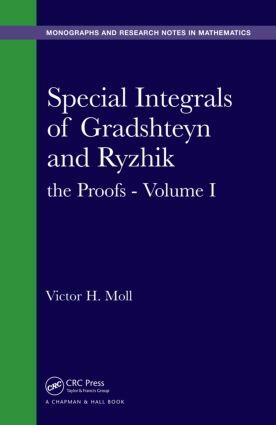 Special Integrals of Gradshetyn and Ryzhik: The Proofs provides self-contained proofs of a variety of entries in the frequently used table of integrals by I.S. Gradshteyn and I.M. Ryzhik. The book gives the most elementary arguments possible and uses Mathematica® to verify the formulas. Readers discover the beauty, patterns, and unexpected connections behind the formulas. Volume I collects 15 papers from Revista Scientia covering logarithmic integrals, the gamma function, trigonometric integrals, the beta function, the digamma function, the incomplete beta function, Frullani integrals, and various combinations. The book presents entries without indicating the range of parameters for their validity, encouraging readers to determine this range themselves. Many entries have a variety of proofs that can be evaluated using a symbolic language or point to the development of a new algorithm. A Family of Logarithmic Integrals. Elementary Logarithmic Integrals. Combinations of Logarithms and Exponentials. The Gamma Function. Some Trigonometric Integrals. The Beta Function. Elementary Examples. Combinations of Powers, Exponentials and Logarithms. Combinations of Logarithms, Rational and Trigonometric Functions. The Digamma Function. The Incomplete Beta Function. Some Logarithmic Integrals. Trigonometric Forms of the Beta Function. An Elementary Evaluation of Entry 3.411.5. Frullani Integrals. Complete Elliptic Integrals. The Riemann Zeta Function. Some Automatic Proofs. The Error Function. Hypergeometric Functions.